Black Angels is a 6 episode crime series. 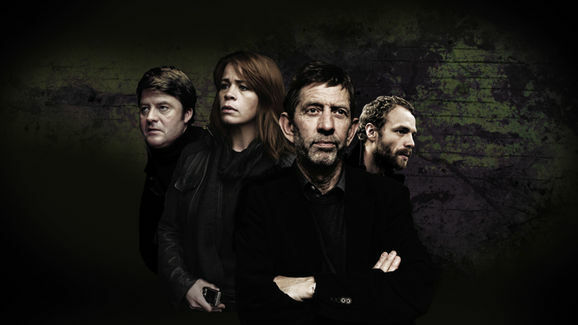 The serie is based on best selling crime novels by Ævar Örn Jósepsson. Ævar has been hugely popular in Iceland and his novels have been translated to various scandinavian languages as well a german and deutch. The Icelandic crime scene has changed drastically from family orientated misdeneanours to more dangerous crimes that are even linked with international, organised crime. The series undertone is the desperation the police experience when dealing with extreme and difficult situations as well as the innerbattle and love affairs of the main characters, their weaknesses and feeling that their job is a no good job. The first episode tells the story of an agency owner who is found dead beneath an apartmentblock. The detective force are quick to discover that he has been murdered. When the force is finally solving the crime another case is on their desks; a woman has disappeared. The woman, Birgitta, is a system analyst and seems to be involved in a mysterious project on the behalf of the Justice department. Edduverðlaunin / Edda Awards - Award: Nominated for Actress of the Year in a Leading Role (Sólveig Arnardóttir). Nominated for TV Fiction of the Year.